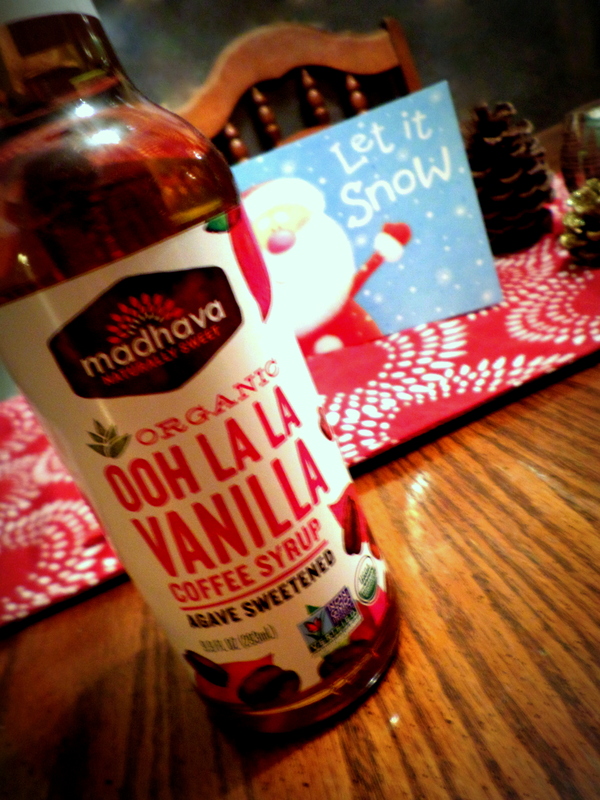 Win a Sweet Holiday Prize Pack from Madhava! The holiday season brings about so many chances to celebrate…and with celebration comes lots of food, glorious food. But there are benefactors who want to help you celebrate AND minimize the impact on your health. Recently, we were contacted by Madhava Natural Sweetners, a company that aims to help you sweeten your life in an organic and healthier way. Madhava‘s company history embodies the meaning of the word organic. Bart Utley started it all by selling honey out of the back of his van and then later partnered with Craig Gerbore on a small operating farm with beehives and alfalfa fields. Even as the company has grown, the focus remains on fair trade, pesticide free, minimal eco-impact honey, agave sweeteners, and the innovative coconut sugar (which boasts a number of key vitamins as well). 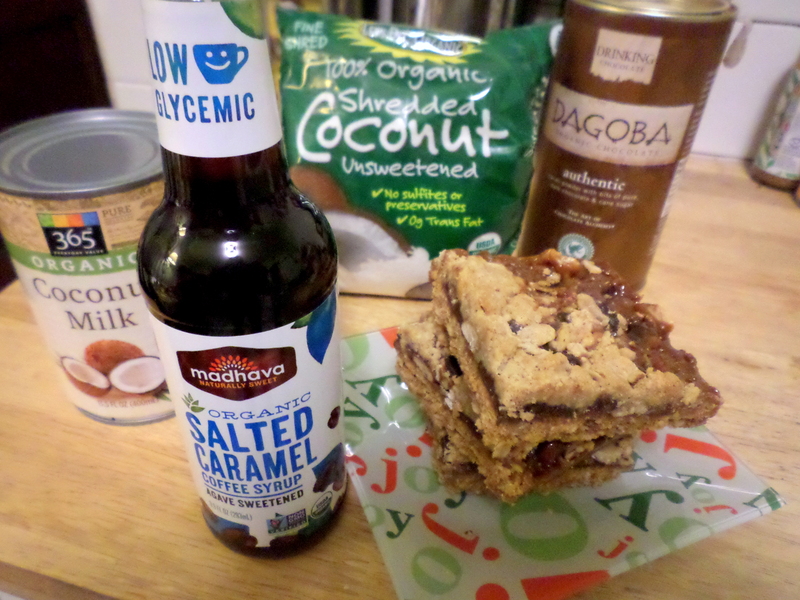 The challenge was this: Create a new recipe with a Madhava product and more importantly, give away an awesome holiday prize pack so you can have Healthier Holidays with Madhava Natural Sweeteners. 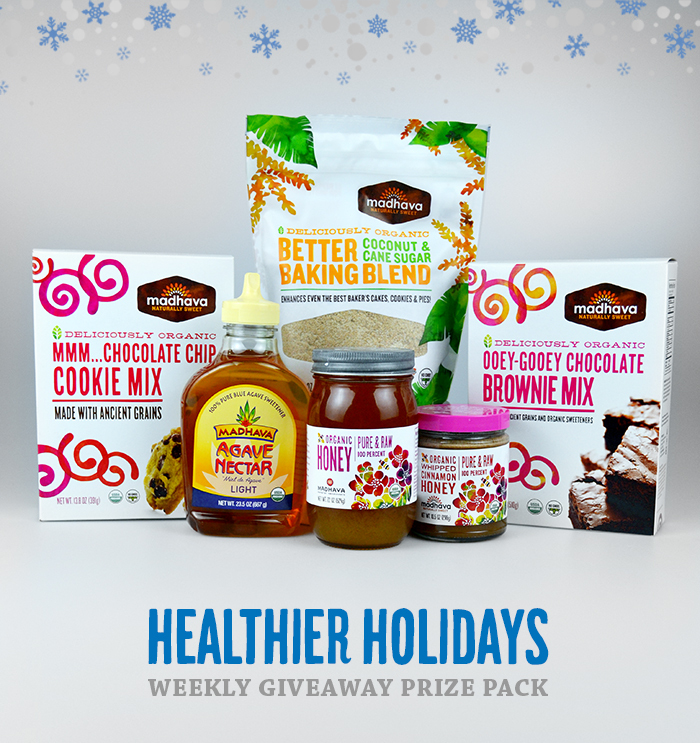 The prize pack contains: Madhava Chocolate Chip Cookie Mix, Madhava Brownie Mix, Madhava Coconut Sugar, Madhava Better Baking Blend, Madhava Agave Nectar and (ooh we really want this one) Madhava Whipped Cinnamon Honey. Entering is simple! Click the link below to tell us what Madhava product you would love to try and score extra points by following Madhava. Bonus is you get to check out new holiday recipes and tips from Madhava while you up your chances of winning! So what sweet fancy treat did we decide to create? Well our product of choice was Madhava Salted Caramel Agave Coffee Syrup. Not sure if you realize this but Chicago is bbbrrrrr cold so hot drinks are all the rage! Recently, we have been treating ourselves to some highfalutin drinking chocolate at one of our favorite local sweets purveyors. Needless to say, why pay $7 for it (and not know what’s in it) when we can make it ourselves (and for others to impress at our next holiday party)? We decided to twist up the normal Salted Caramel trend and were inspired by an old 60’s throwback dessert, the Dream Bar, AKA the “Caramelita” in other circles. These addictive high calorie desserts normally include a devious combination of caramel, oats, chocolate chips, butter (tons of butter), and evaporated milk or heavy cream. Madhava helped us lighten it up and still make a tempting yet less devilish dessert. Believe us, this is easier, healthier, quicker and (dare we say it) maybe even tastier than an actually Dream Bar! Shake 365 Coconut Milk. Use a liquid measuring cup to measure out 1 cup of coconut milk. Pre-heat a 1.5 quart (or smallish) sauce pan. Turn the burner on low. Pour in the coconut milk and stir slowly. Stir continually with a whisk or heat safe spoon until the milk has vapors rising. Measure out 2 Tablespoons of drinking chocolate and stir continually until the chocolate has melted in the milk and no chunks of powder are left. Once the powder has melted, turn the pot off. Immediately stir in 2 Tablespoons of Madhava Salted Caramel Coffee Syrup. 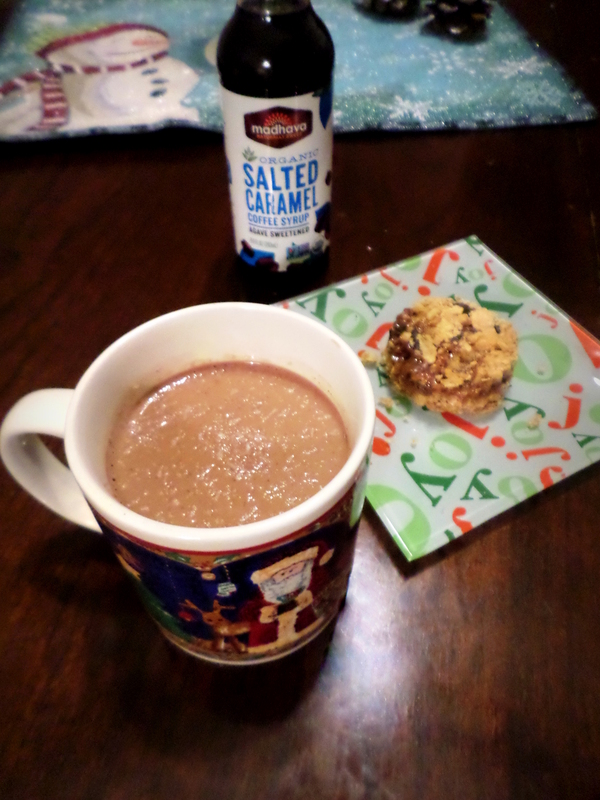 Pour your Dream Bar Hot Chocolate into a mug. You will notice there is some space left. For a very rich drinking chocolate, garnish with coconut shavings and drink as is. For lighter drinking chocolate, pour 1/4 cup of So Delicious into the remaining chocolate residue left in the pan. Turn the burner back on low and stir the milk for about 3 minutes or until hot. Pour the milk mixture into the mug and stir for a thinner consistency. You could even substitute the 365 Coconut Milk at the beginning of the recipe for a cup of the So Delicious Coconut Beverage to drastically reduce the calorie and fat count. Use your leftover Salted Caramel Syrup as a low glycemic way to liven up coffee or pancakes! Agave does not need to be refrigerated so it can hang next to your coffee pot. Ready to make your own HOT holiday Madhava drink? You can find Madhava products at Target, Whole Foods, amazon.com and madhavasweetners.com. Feeling Inspired? What recipe will you create with Madhava? Will you share with us?! Small note: Although we have never been compensated previously, we are being paid to promote Madhava products! We want you to know, however, that we wouldn’t accept money for or promote something we don’t love. Whipped cinnamon honey sounds delicious!! !